There's a very good chance you already know about Facebook and the importance of having a business page there for customers and prospects to use to interact with your small business. 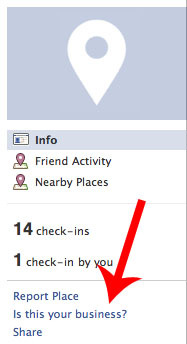 With that said, did you know that people can now check-in to your brick and mortar location from Facebook? What's more they can even check in the people they're with, which has a huge potential of exposing your business to people who didn't know about it. Facebook is far and away the most popular social network in the world, so any chance to get some extra eyeballs there should be welcomed with open arms by yours or anyone else's small business. So then, it's time to claim your Facebook Places listing! There are a few different ways you can interact with Facebook Places. The simplest is to fire up your mobile web browser and visit touch.facebook.com and then head on over to the "Places" tab. You can also access Places from the Facebook application available on most popular smart phones, such as Android and iOS-powered devices. From the Facebook search box, search for your business to claim it. Once you've landed on your business's page, in the left-hand navigation there will be an option that asks "Is this your business?" like in the image to the right. Click on it. Alternatively, if you can't find your business via the Facebook search (which means nobody has checked into or listed it yet), simply follow these steps to create it yourself. Click the "Add" button to the left of the Places Names search box. Enter a name for the new Place as well as an optional description of it. Then, click the "Add" button at the bottom right of the page. Click the "Check In" button to share your visit. Now that your place has been created, you can use the same steps mentioned above to claim it. Note that in order to verify your claim on your business Facebook will ask you to step through a phone verification process. Alternatively you can have verification papers mailed to you, but in most cases the phone verification process is much more quick and painless! 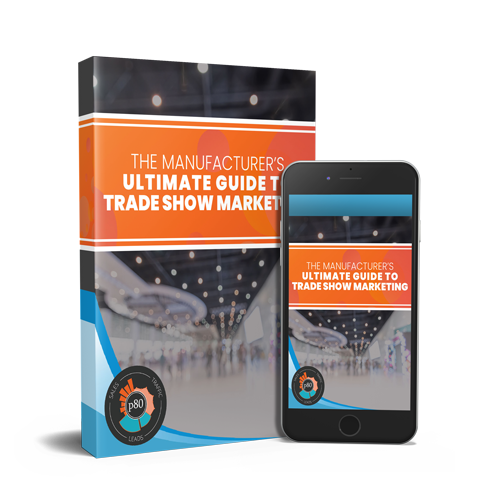 As I mentioned at the beginning of this post, hopefully you've already setup a page for your business. Now that you've created a Facebook Place for it as well, why not link them up instead of having two separate entities to confuse your customers? You can do this by visiting your business's Facebook Place and clicking the "Merge With Existing Page" link in the left navigation. This will bring up a box of all of your available pages, click the one you want to merge the place with and map plus check-in data will be imported into your Facebook page automatically! Essentially, merging your page and place give people one central location on Facebook to visit in order to interact with your business, and with the Places information built-in they get a richer experience. Pretty cool, huh? One thing to note when you're considering merging your Page and Place is that you do lose certain page functionality when you do so, and the merge is irreversible. The biggest feature loss is the ability to set a landing tab on your page, which is huge if you've invested time in setting up custom tabs on Facebook. Be sure to weigh the costs of merging before you commit! 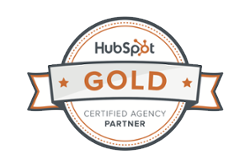 Now that you've claimed and merged (or not) your Facebook Place, what's next? 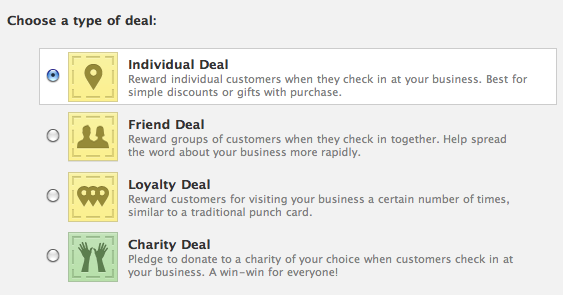 Well, essentially Facebook Places allows you to create offers much like Foursquare. You can setup specials for customers visiting your brick and mortar location that have checked-in on Facebook Places with a new feature called Facebook Deals. Finally, review your deal in the deal preview and send it out to your adoring fans! 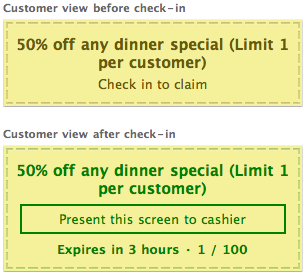 They'll see the deal listed when they go to check in at your location, and they can then redeem it. Much like with Foursquare, Facebook has set up deals focused towards customer acquisition as well as customer retention, so be sure to try all of the different kinds of deals to ensure you attract customers! That's it! You're now a Facebook Places pro. It's important to cast a wide net when approaching location-based services, so be sure you have your Google Maps and Foursquare locations reserved as well. I've written handy guides for setting those up as well, so look below to get started if you haven't already! Step 1: Visit facebook.com and search for your business. Step 2: If your business is found, visit its page and click the "Is this your business?" link. Step 3: Follow the steps to verify your ownership of the business. Note: If your business isn't found or if you run into other issues, please refer to the post above, or leave a comment and we'll try to help you out!